The Robert Morris Colonials (15-15-4, 4-7-3 CHMA) will go dancing in the ACHA Tournament as the No. 20 seed and will face the No. 13 Nevada-Las Vegas Rebels on Thursday at 11:00 AM at Comerica Center in Frisco, Texas. UNLV became a Division 1 team in the ACHA last season and plays an independent schedule. They clinched their postseason spot by ranking No. 13 in the nation. The top 20 ranked teams received an invite to the national tournament, unless they were bumped in favor of one of the six conference champions, who received an automatic bid to the tournament. Three conference champions, Adrian, Liberty, and Arizona, were ranked No. 3, No. 8, and No. 9. The remaining conference champions, Drexel, Buffalo, and Robert Morris, bumped Syracuse, Colorado, and Western Michigan to take the final three spots. 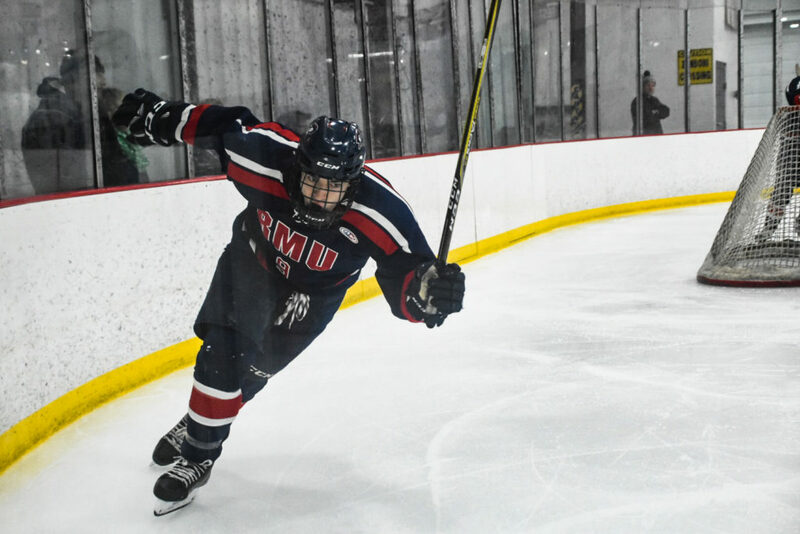 WHY ROBERT MORRIS CAN WIN: The Colonials made a name for themselves during the CHMA playoffs with an offense that proved too much for teams to overcome. As the No. 6 seed, they took down No. 3 Pitt in the quarterfinals, 4-2, top-seeded IUP in the semifinals, 6-3, and Slippery Rock, in the championship, 8-7, in an overtime thriller. Robert Morris has four players with more points than UNLV’s top scorer, Paxton Malone (32). Forwards Joseph Zottola and Nathan Mickey have 47 points (21 goals, 26 assists) and 46 points (20 goals, 26 assists), respectively. Andrew Hachmeister has 36 points (17 goals and 19 assists) and Steven Ralston has 16 goals and 17 assists for 33 points. It is clear the Colonials find their scoring from a variety of places on their roster. That same scoring touch against a team that gives up 2.42 goals per game can make Robert Morris only the second team in the history of the CHMA to win a national tournament game. The last conference team to win a national tournament game was West Virginia in 2007 when the Mountaineers won a 13th place consolation game against Kent State and 2012 when they defeated Rutgers. They fell to Penn State in the second round that year. The Colonials last made the national tournament in 2015, falling in the first round to Niagara. WHY NEVADA-LAS VEGAS CAN WIN: Although the Rebels have dropped five of their last 10 games, the quality of their opponents has prepared them for the national stage. Seven of the 11 unique teams that UNLV has faced this season finished the season ranked in the top 25. By comparison, Robert Morris has only played three teams currently ranked in the top 25. Although this is the Rebels’ first trip to the national tournament, the experience of playing against some familiar opponents should ease the team’s starstruck moments and allow them to focus on the games on the ice. The entire tournament schedule can be found here. All tournament games can be streamed live for free on the ACHA YouTube channel here.